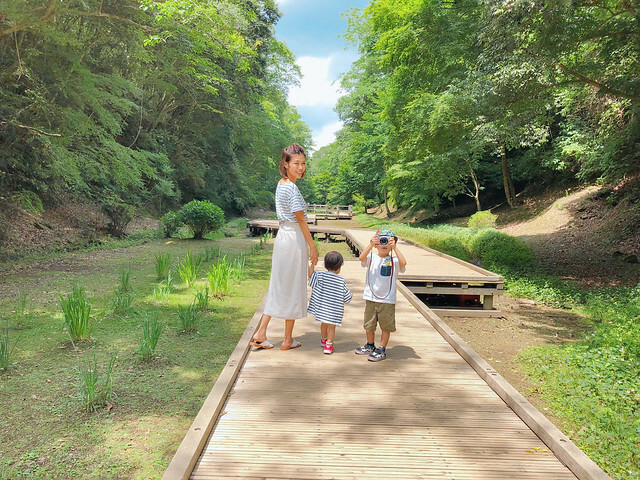 A small getaway from Tokyo. 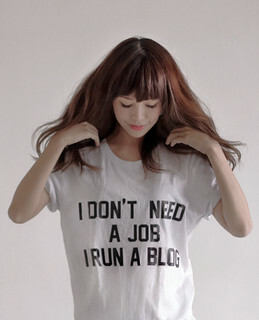 People who live in Tokyo always say they are tired of Tokyo. 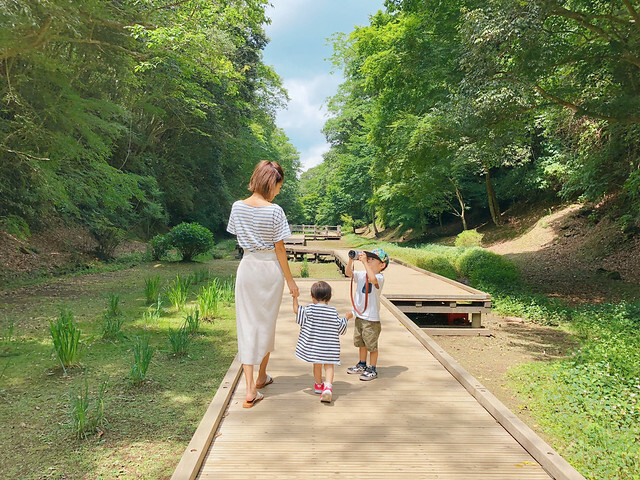 I guess I can understand how they feel, because Japan is SO HUGE, when you’re in Tokyo alone you feel like you are missing out the ocean, the far-reaching meadows, the vast farms, the human intimacy that’s not in the form of a crammed rush-hour densha. 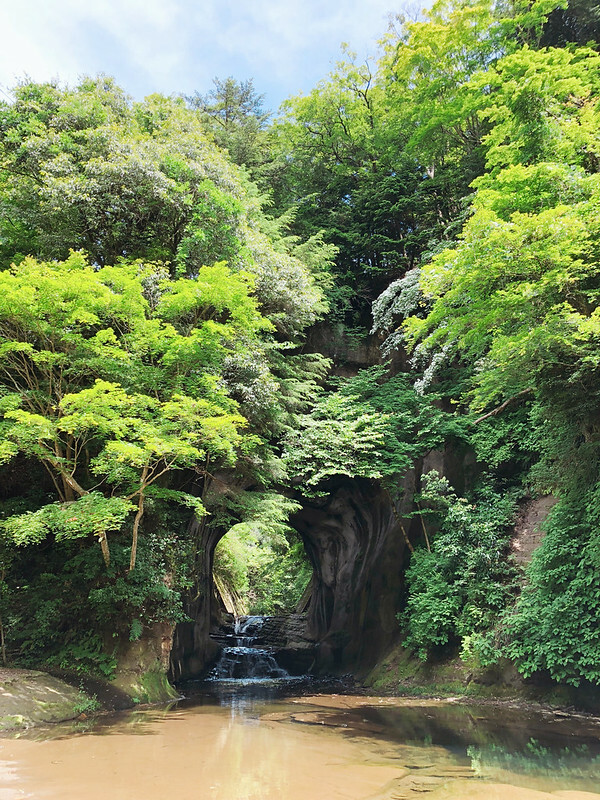 Kamogawa Kan in Chiba is amazing. 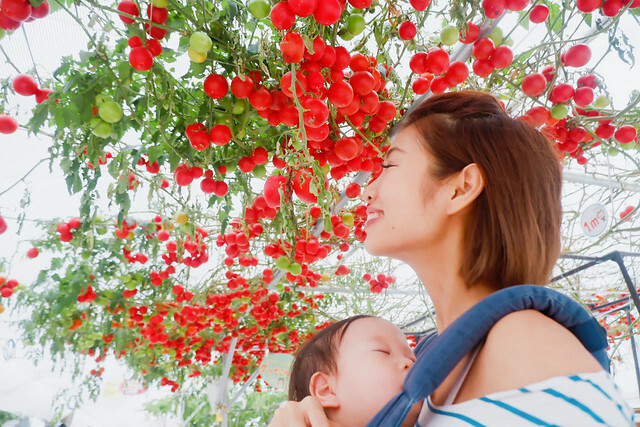 I could particularly appreciate it lots because of how children friendly it is. Top notch omotenashi I experienced the moment we were brought into our ryokan room. “Did you all just came back from the beach? I see that your slippers are all a little wet, shall I bring it away to dry and return it back once it is ready?” asked the young, Japanese bellboy with a bright, friendly smile. I was so shocked and a little embarrassed that I told him no no don’t need to trouble you omg. 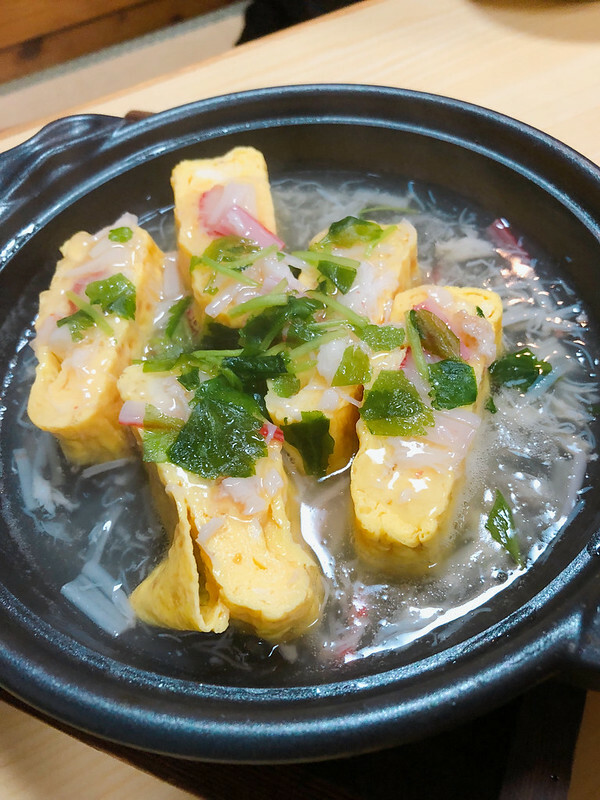 What is this level of omotenashi? 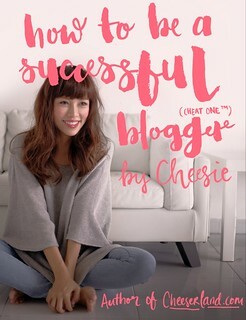 At that point of time I thought, this is going into my #cheesieapproved blog post I swear. 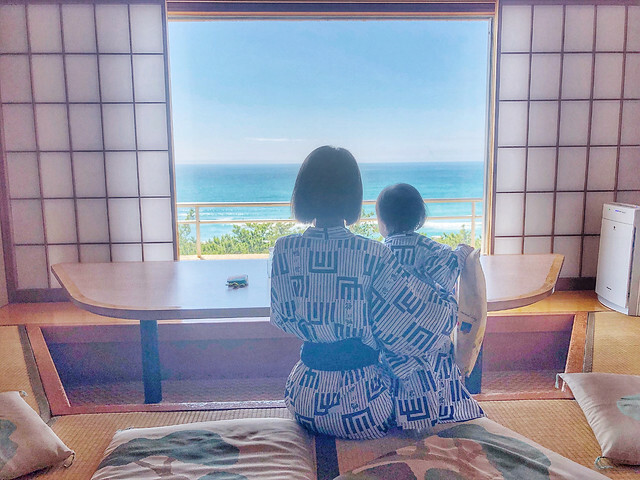 I know not many people choose to stay in Chiba area where there’s nothing much to do except for the beach, aquarium, and some summer fireworks with literally almost nobody lol, but here you are, experiencing true Japanese hospitality at its best. 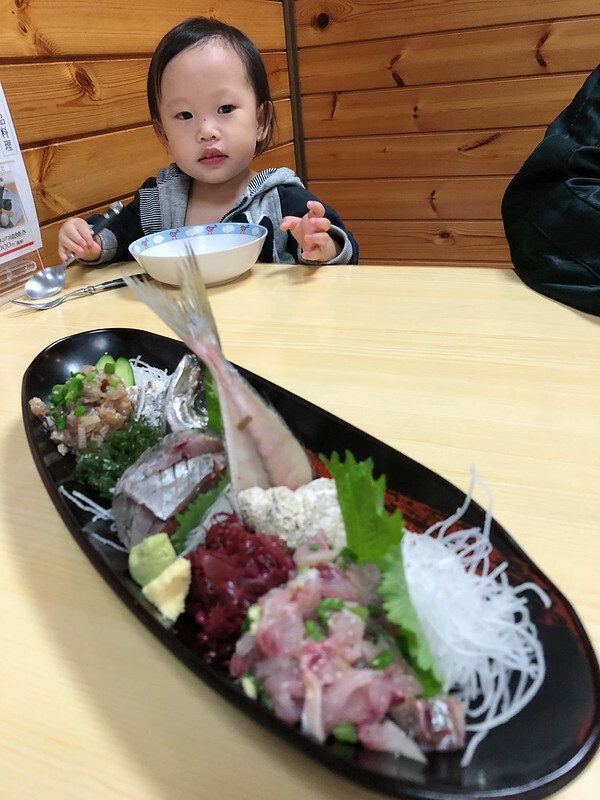 You feel more at home at this neighbourhood ryokan than you ever will at exquisite 5-star hotels, everyone here was genuinely helpful and cheery. Maybe I was really a little tired of Tokyo haha. 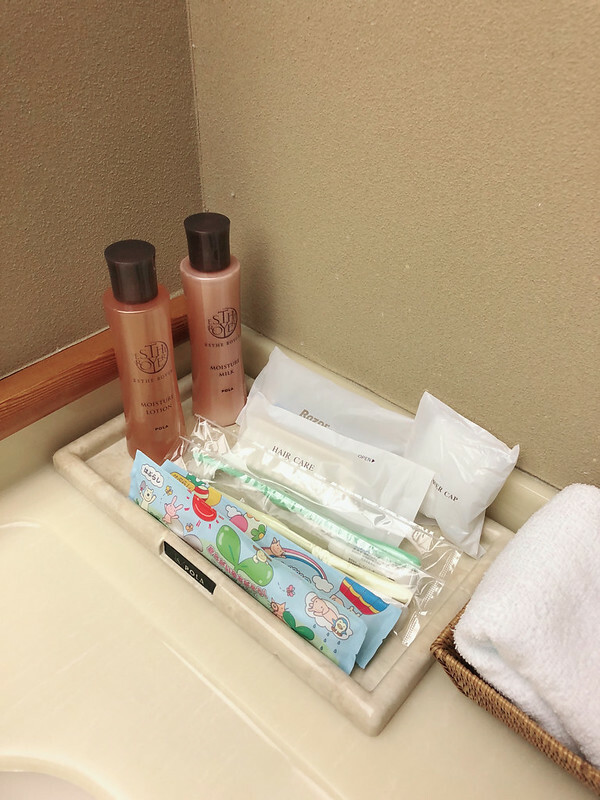 Upon knowing that we are checking in with two children, there are kids’ amenities prepared in our bathroom. 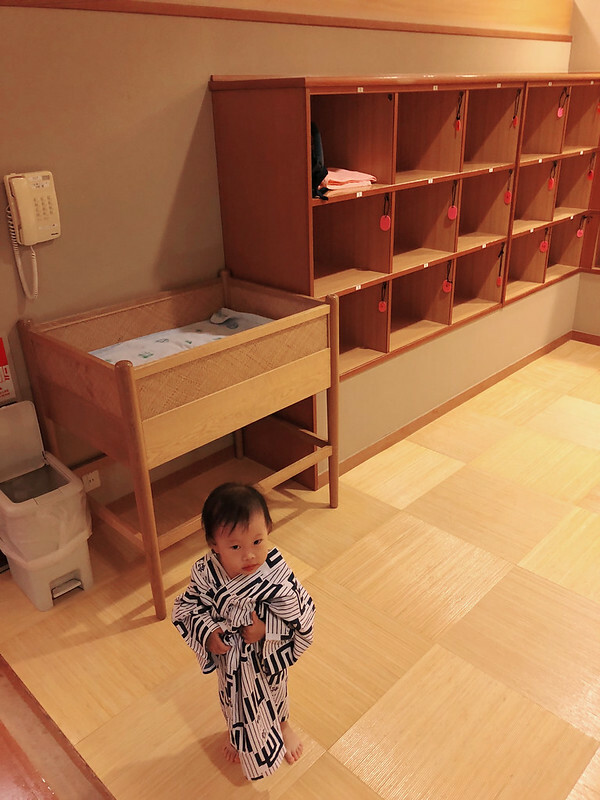 Most ryokan in the suburbs come with a babycot where you could change your little one, or place her there while you get changed. 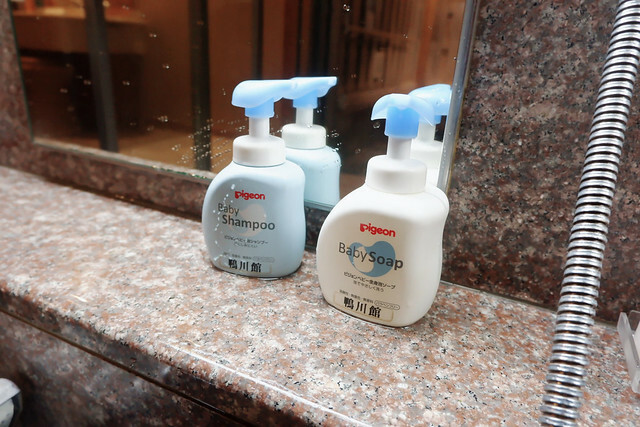 They had the latest Repronizer (the same brand that makes the magical Hairbeauron) omg… I own one but it was the old model. I didn’t expect them to catch up so well with the latest beauty trend😂. 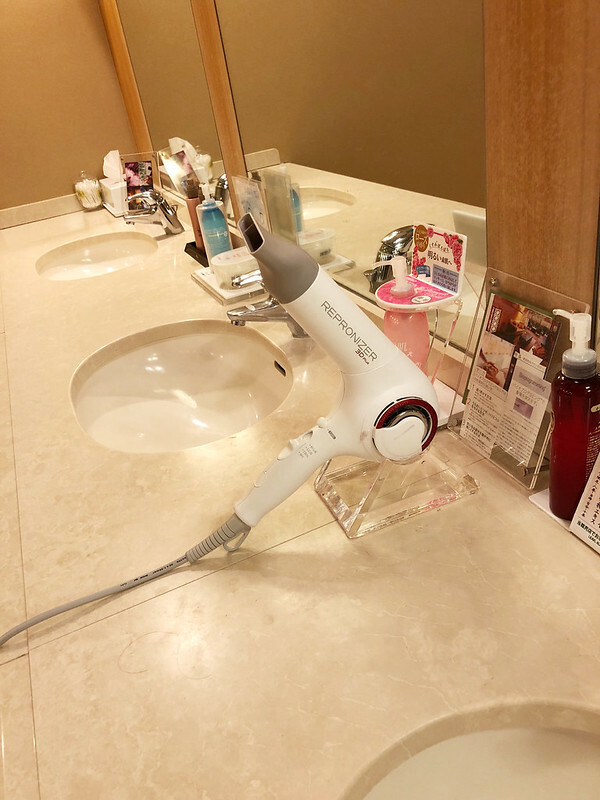 This is the best hair dryer in the world (for now). 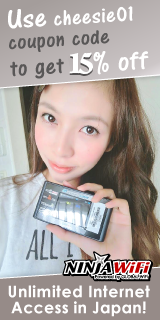 Unfortunately you could only use it in Japan due to voltage limitation. Hair brushes are of course all sterilized and ready for your use. The public bath is amazing! 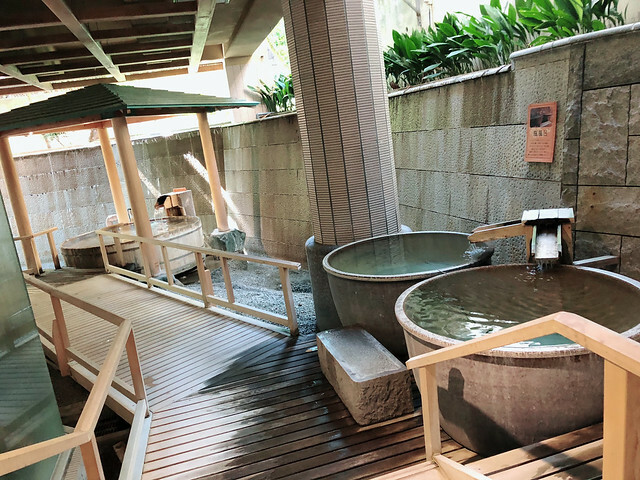 The two huge bowls are individual onsen haha. You just soak inside all by yourself don’t care about other people. Anyway I snapped this photo only because no one else were in the public bath that day. Please don’t report me haha. Just wanted to share!! We booked the private bath so that our whole family can go in together, and there was this high chair for little ones. Junya was trying to buckle up for his sister haha. 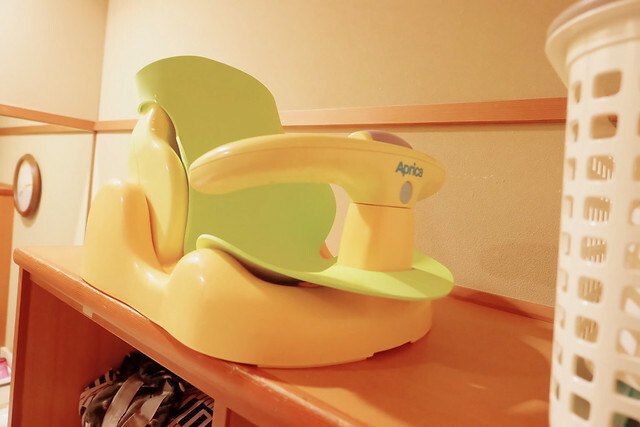 For the very small babies, you have bath chairs! 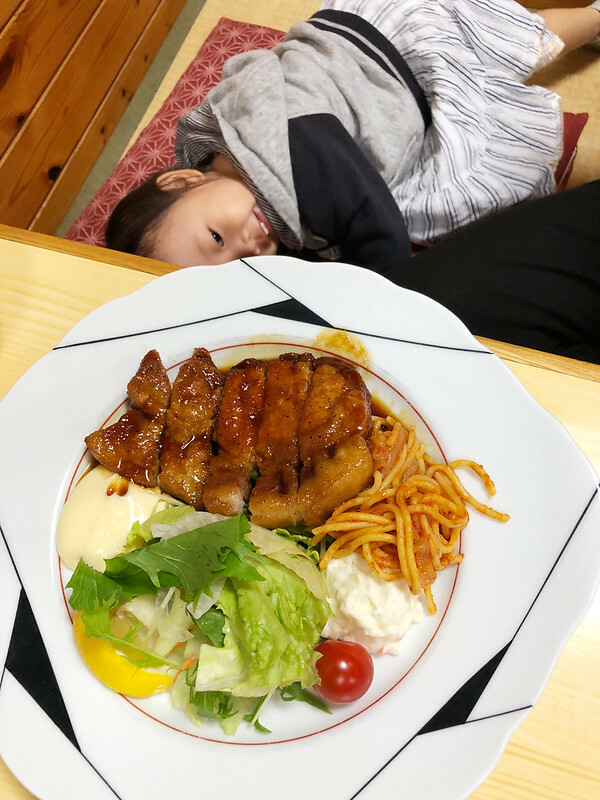 Actually it’s not that uncommon in ryokan but after being away from Japan for a while, I start to miss all these little thoughtful details and appreciate them more. 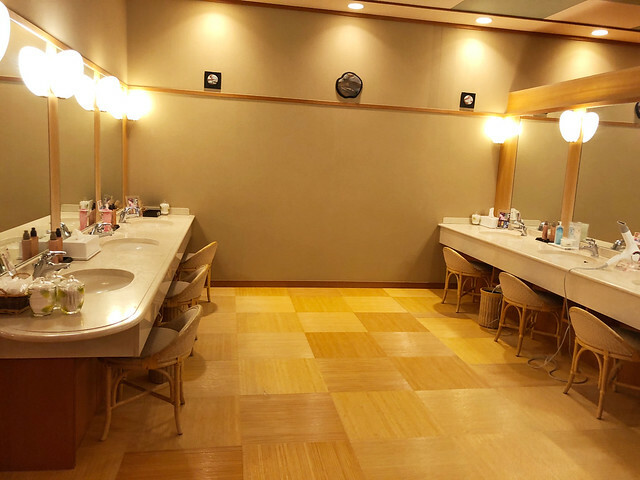 There’s this common area outside both the men and ladies’ public bath where you can sit down, chill and have a few drinks from the vending machine (also free flow chilled water and fruit vinegar from the bar!!! ), and the little ones can read some books, play with the drawing board. We spent close to an hour here cuz the two of them were too awake playing. It’s not really a big deal but this was the first time I saw mini pillows for the kids, nicely arranged in the middle haha. 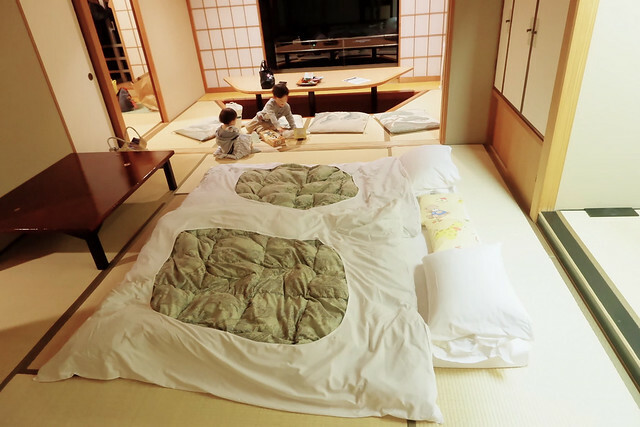 Usually they only have the children-size yukata but this just makes the futon look so cute! 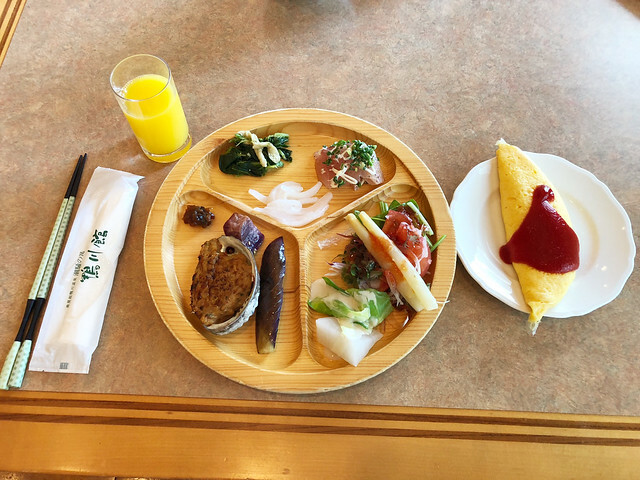 Breakfast buffet was really good, the usual Japanese fare and you can be sure to find things the little ones will happily eat. 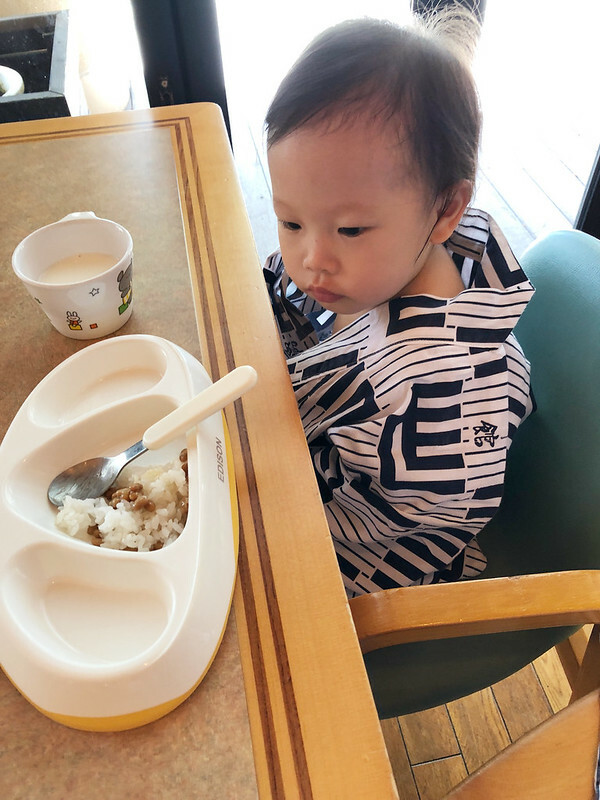 She wasn’t having much appetite but Natto rice and milk will always do. 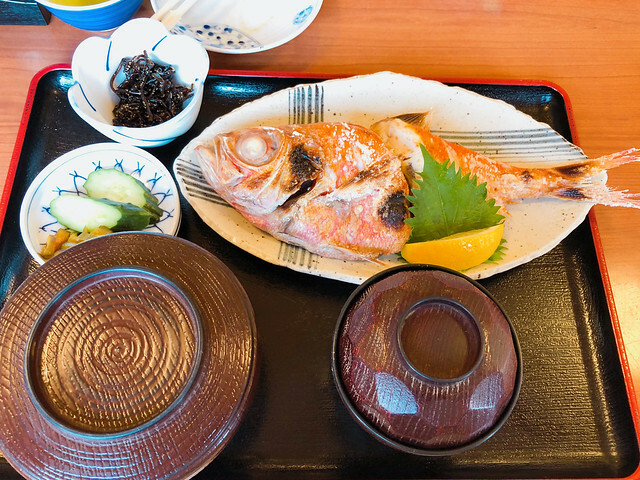 For dinner it was an izayaka nearby the ryokan. 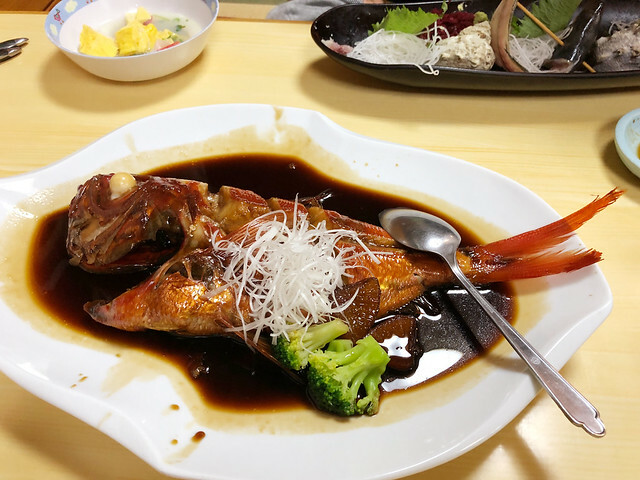 Seasonal fresh fish – Aji. 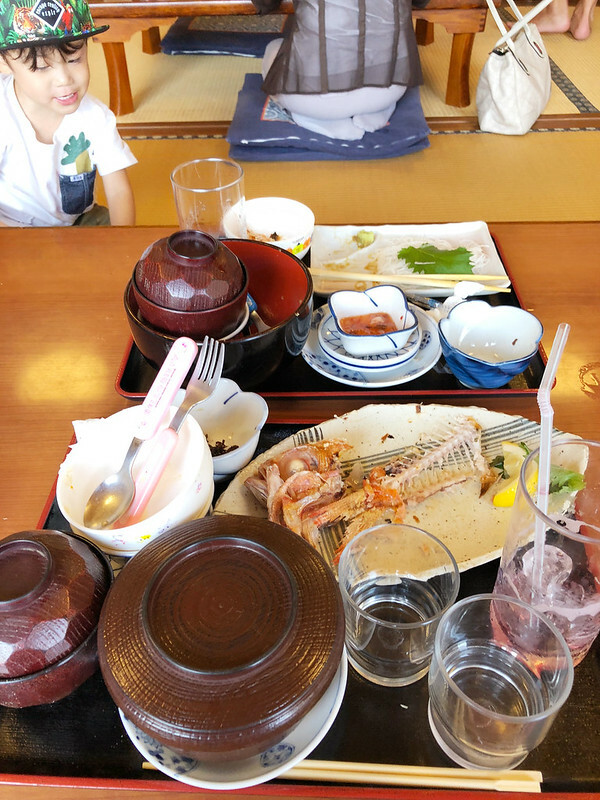 We totally overordered (but managed to finish everything), and the bill came up to something like only 10,000 yen. That’s waaay cheap! This is the place for the next day’s lunch. I was instantly in love. 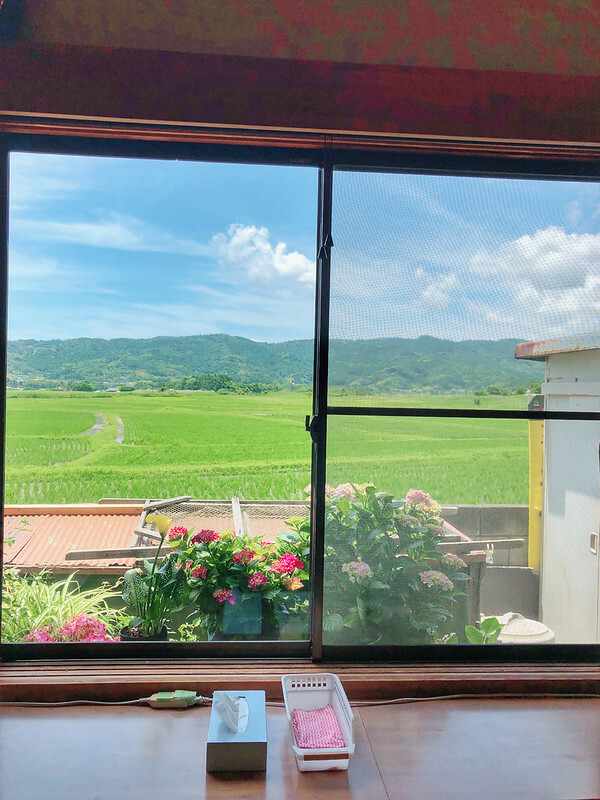 It’s probably a scene all the inaka (suburb) people see every day but there’s something so soothing and therapeutic about this window view from a canteen-style lunch place. It’s quite a popular place to enjoy fresh fish, the whole restaurant was full when we were there. 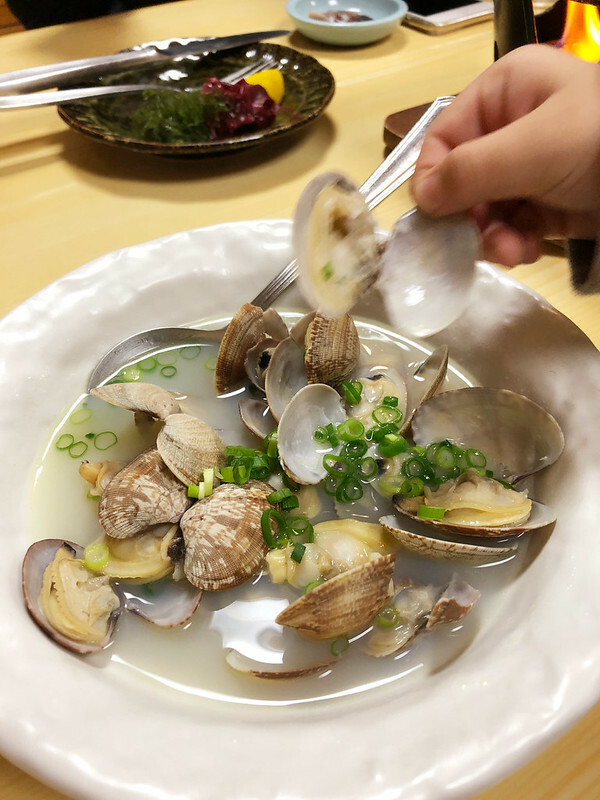 Their famous, again it is Kinmedai. 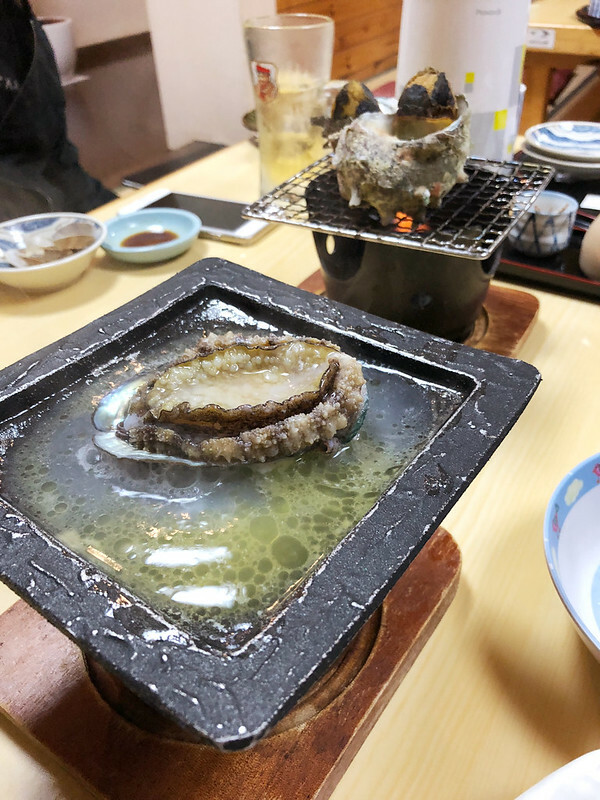 Yesterday we had it simmered in sauce so today I ordered salt-grill. So, SO GOOD. 1,500 yen for this set. 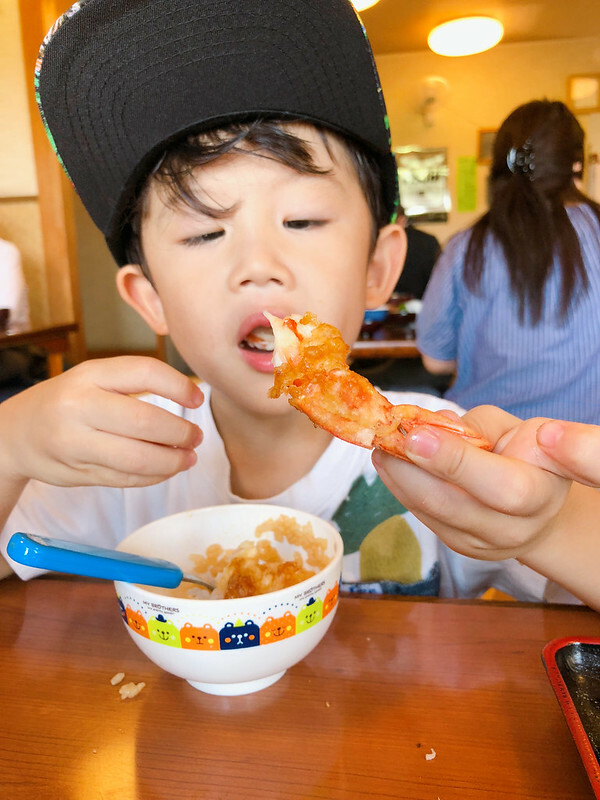 The kids were sharing a jumbo Ten Don (tempura rice bowl), for also 1,500 yen. 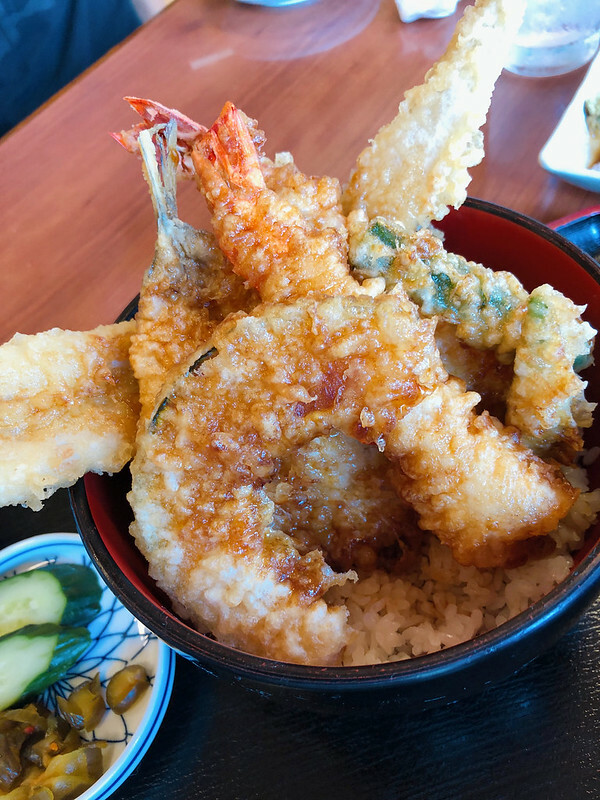 The ebiten was one of the biggest I’ve seen, and it’s not covered in lots and lots of batter to make up the volume, It’s real jumbo ebi!! Stacking everything in the tray. I admit it could have been done better haha. I need to level up this. 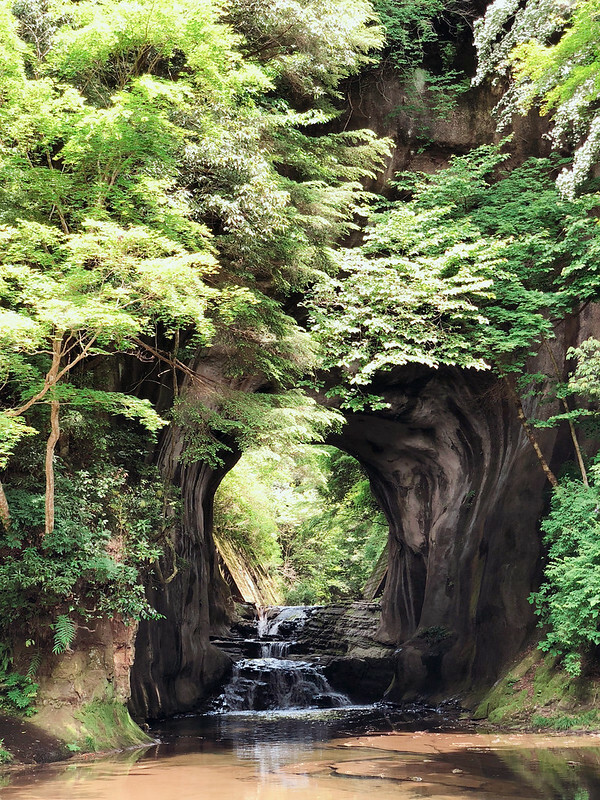 Anyway, despite all these awesomeness, you still probably will never be convinced to make a trip all the way to Chiba. I’ll give you one extra solid reason here. 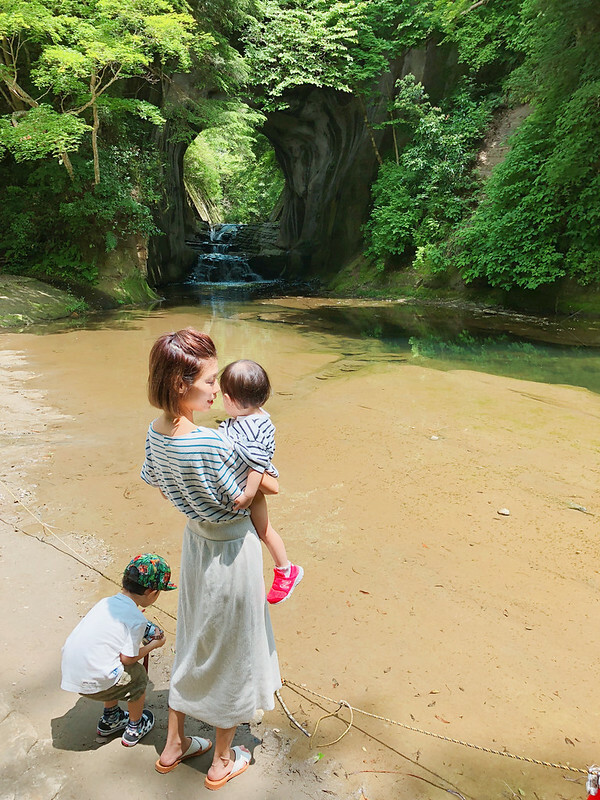 Nomizo Waterfall (濃溝の滝) is also called Kameiwa Cave (亀岩の洞窟), it’s a waterfall AND a cave in Kimistu, Chiba, and it’s recently become one of the super popular Instagenic photospots for many tourists because of one photo that was uploaded by a Japanese user on Instagram. 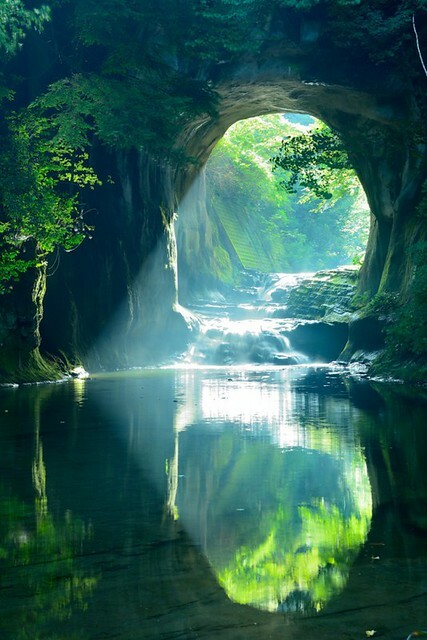 When you manage to catch the morning sunlight as it enters the cave, creating a heart-shape with the reflection on the river. 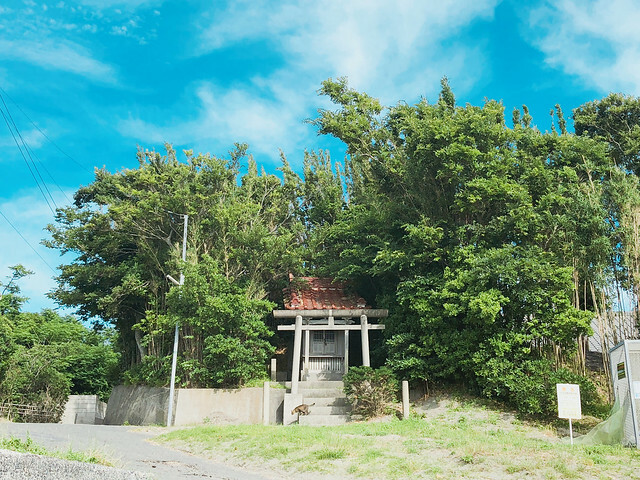 Many people has described it as a real-life scene out of Ghibli’s anime. It’s not hard to see why. Surely you can spot a Totoro hiding somewhere if you find hard enough. Junya was busy taking photos of the little tadpoles in the river. To get to the cave, it’s quite a steep walk down the stairs, but on the way back, you take a different path that I enjoyed even more. It was a long, beautiful walk on wooden board surrounded by the freshest hues of greens. 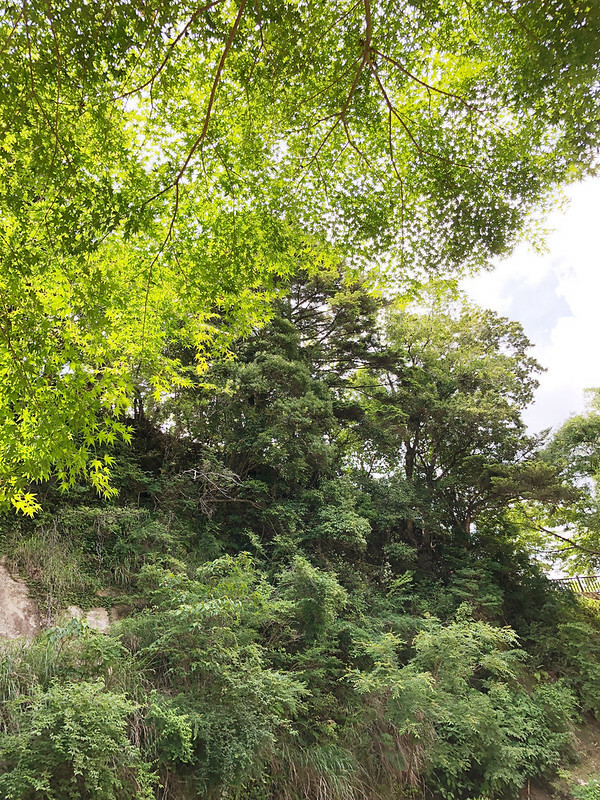 Spotted momiji leaves in lush green. If you come in autumn, this walk will be filled with the prettiest shades of gold and red. And if you come around at night, there are even fireflies!! 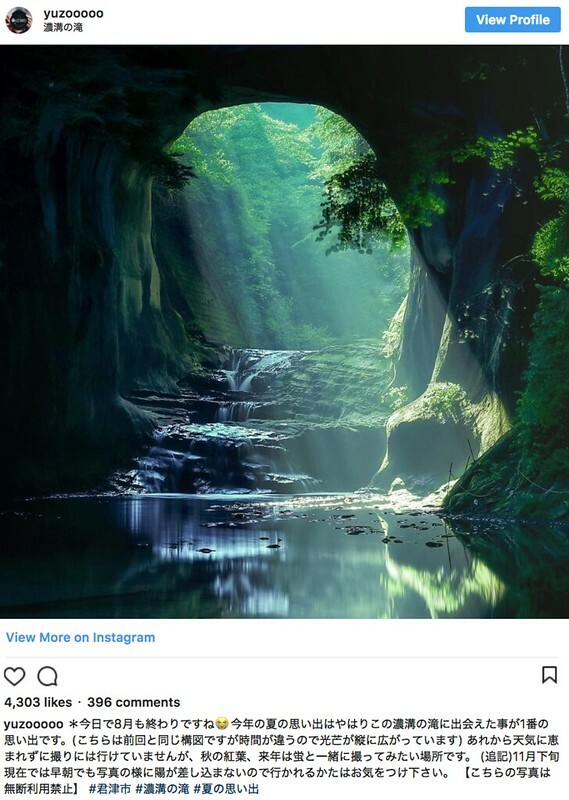 I uploaded live IG stories and many followers commented that they couldn’t believe such a place that look like it’s straight out of an anime exists in real life. It really does, and that’s why you have to see it for yourself. 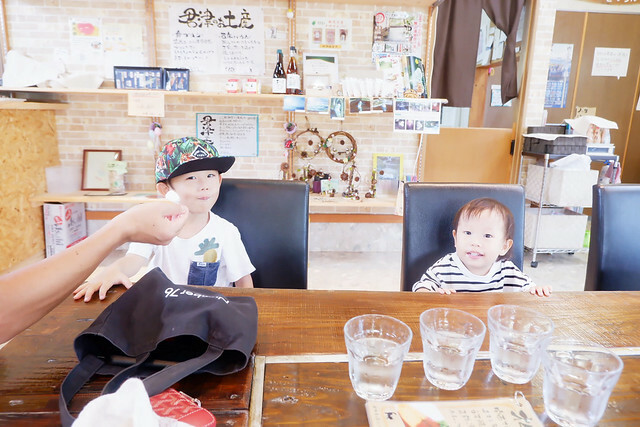 Once you return back up, there’s a little cozy cafe at the opposite site where you can take a rest and enjoy its popular soft cream. 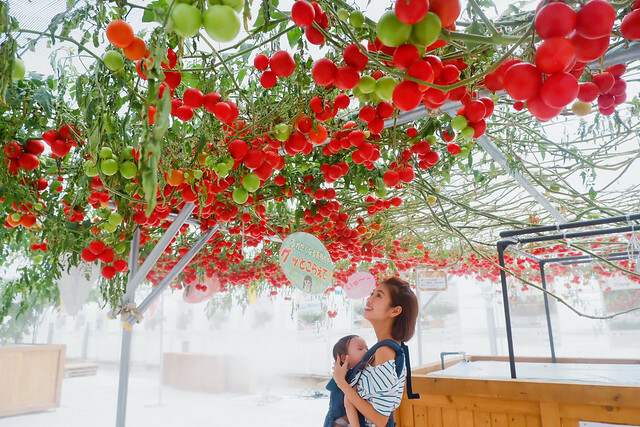 This place was recommended by the ryokan staff, we were told that the little ones would enjoy the tomato and melon “ceiling”! 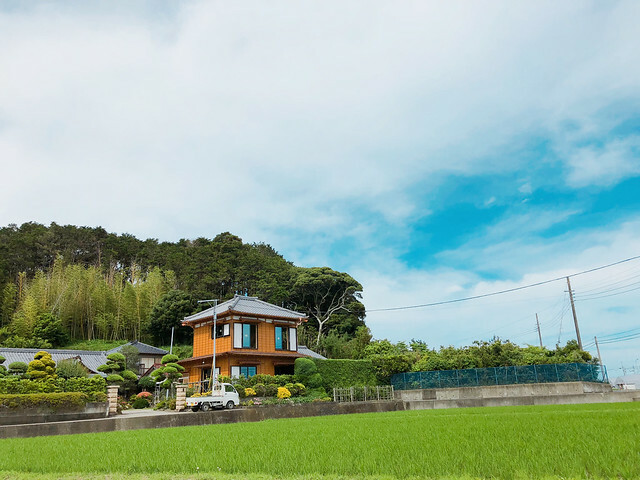 Opposite the farm is a house surrounded by all green. I wonder how it is like to live there! It’s real!!! Tomato galore hanging from above! 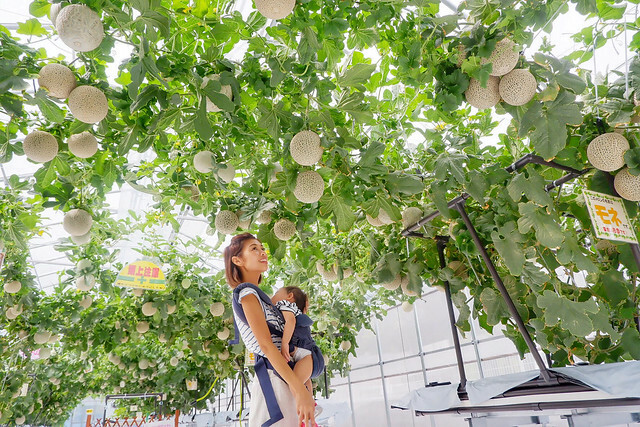 You can also visit the melon farm, where different species of melons also grow from above you! 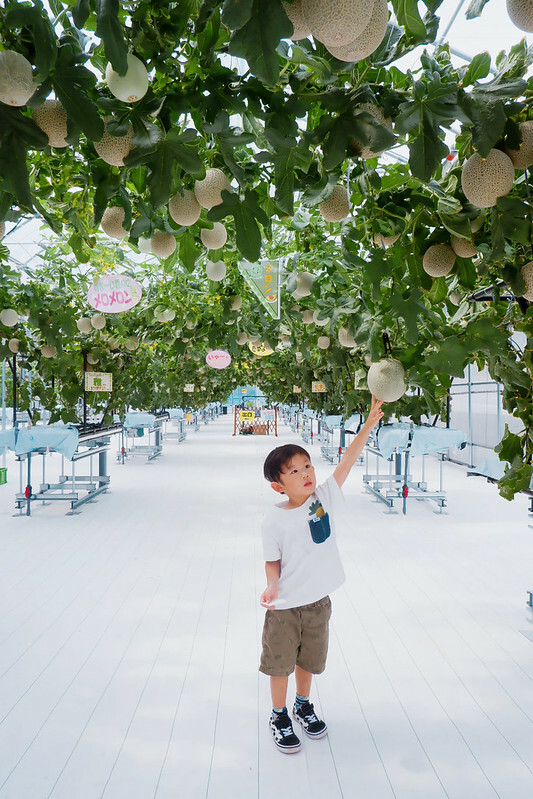 You get a tasting slice of melon for the 500 yen entrance fee you paid for both the farms. Yummy! 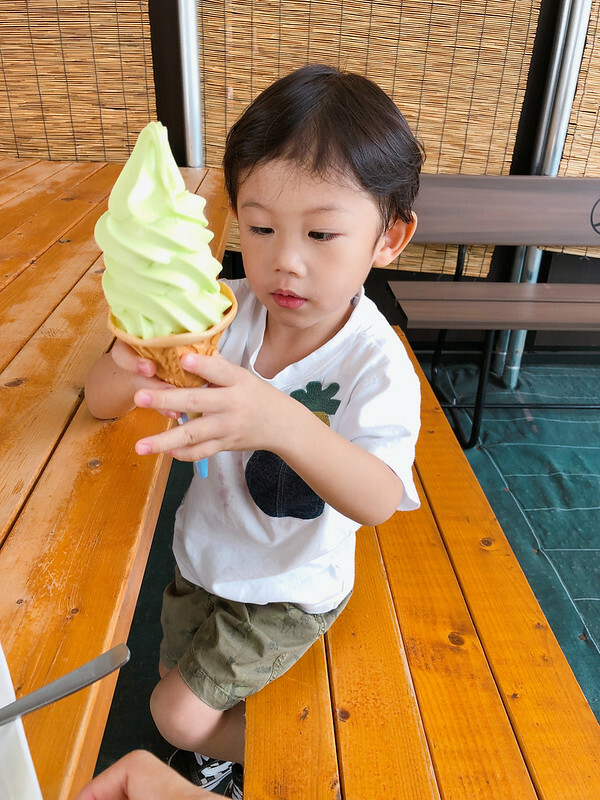 We also bought melon soft cream after for Junya. 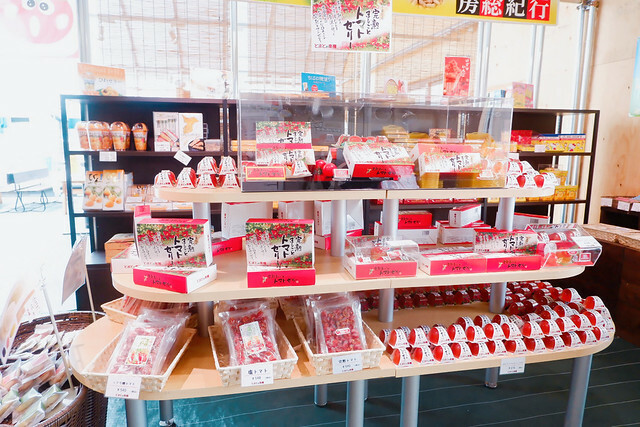 Next to the farms is a market selling fresh and ready made produce, mostly tomato-related products! 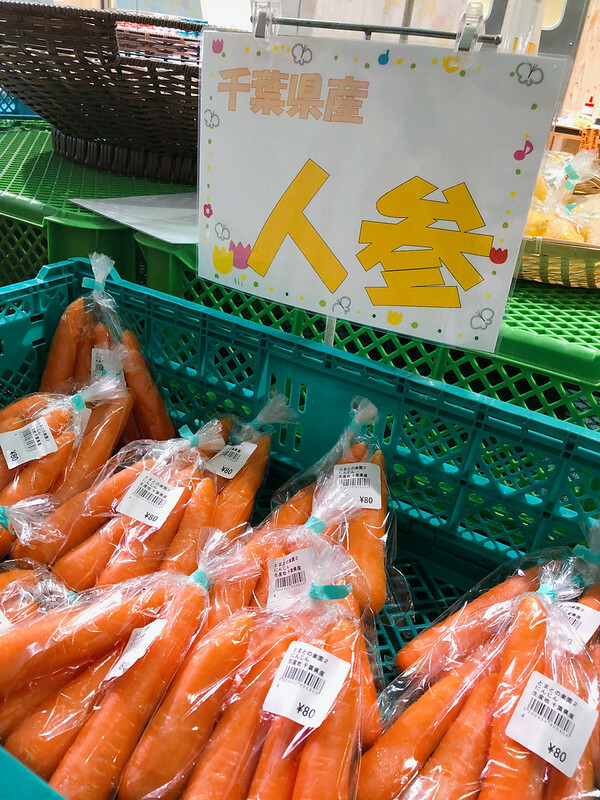 And then I went crazy looking at the price of the fresh vegetables there. 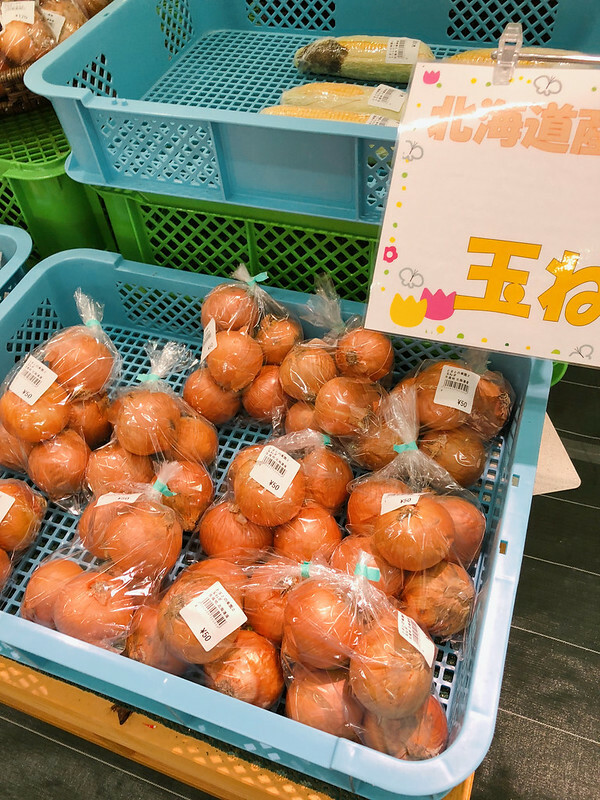 And a pack of Hokkaido onions for 50 yen. 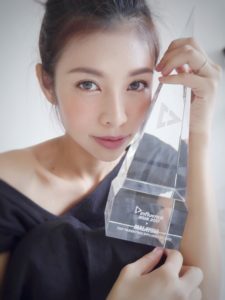 I had to look several times to make sure I didn’t see it wrongly. 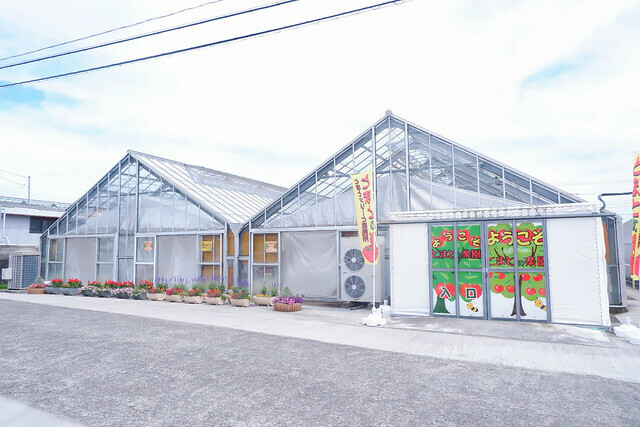 I bought tons of vegetables here to bring back to Singapore haha. Cabbage, cucumber, potato, and of course the carrot and onion. And I made kickass Japanese curry with them. 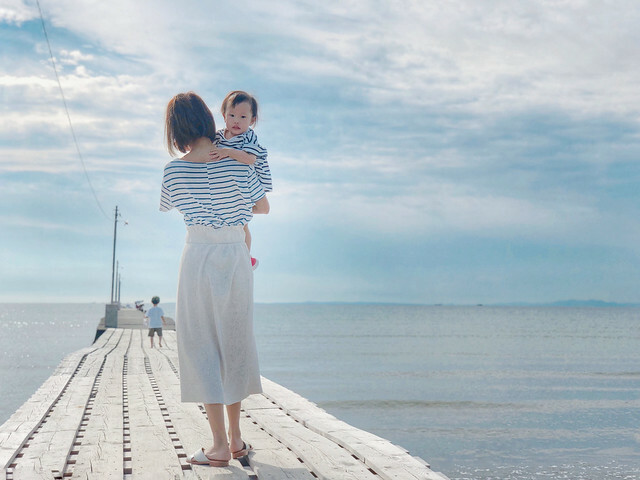 Junya said he wanted to go to the beach so we drove to a random seaside. Tomiura, Chiba, on the way back to Tokyo. I love shrines especially the ones out of nowhere. Not exactly beach but we took a walk on the sea! On the way back to SG. Angmoh impressed with the kids haha. Wow very nice scenes…. i like it… wish one day i can visit this places. 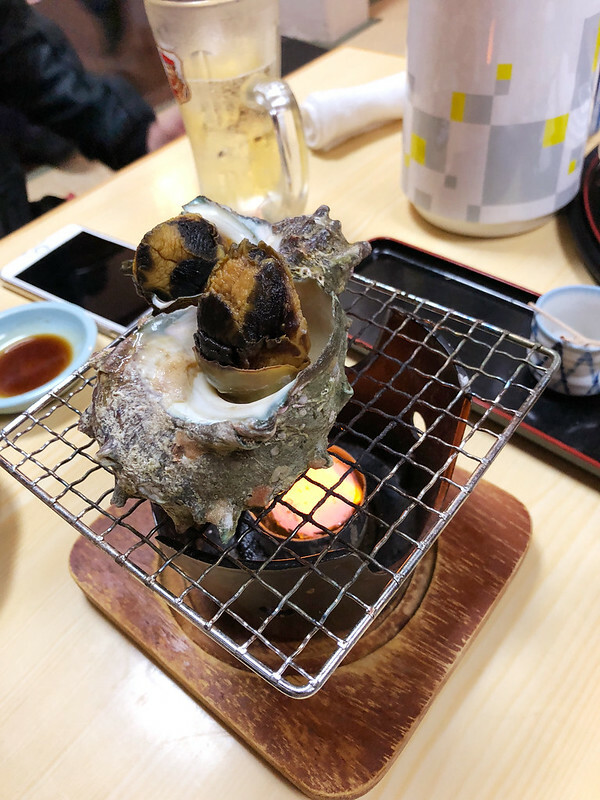 Yakizakana… wow i like it. 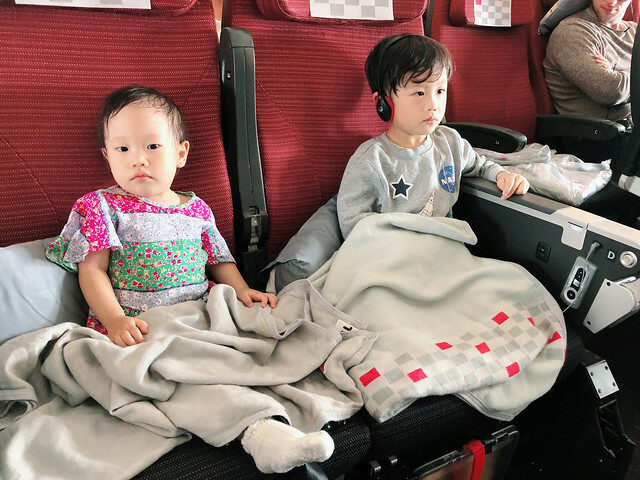 Hi Chessie, I am intending to go to Japan next Apr or May with my going 4yo boy and another 4mth boy (as at Apr 19), which part of Japan will u recommend and any car rental u will recommend? 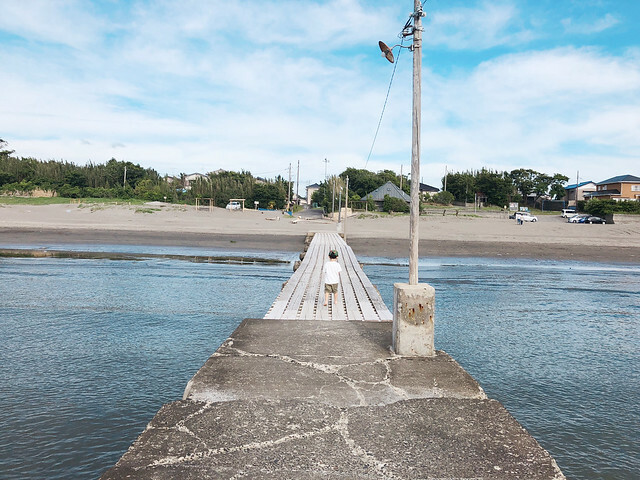 How did you travel around Kamogawa? 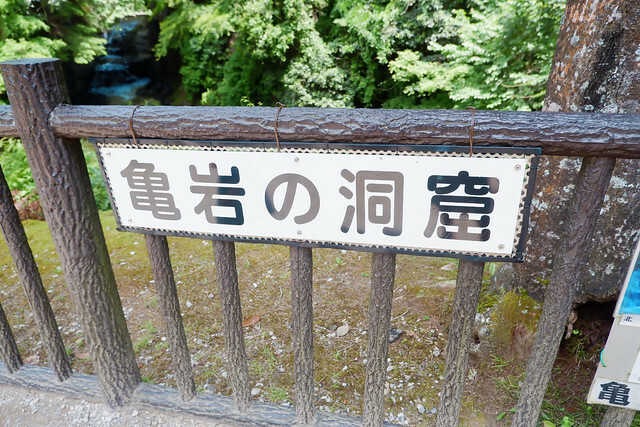 And how did you get to Kamogawa from Tokyo?